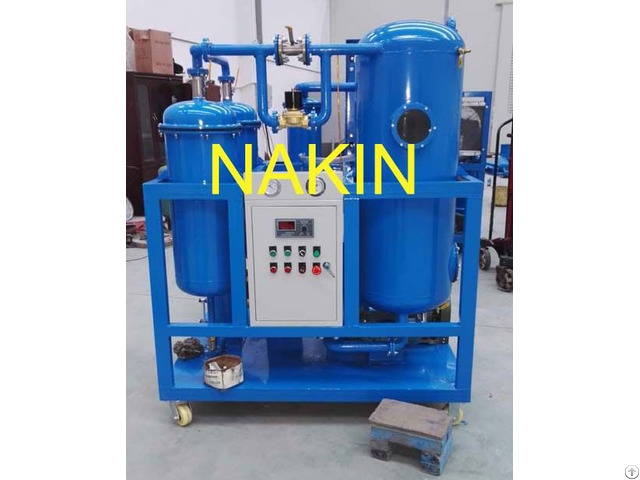 Series TY vacuum turbine oil purifier mainly be used for purifying unqualified turbine oil, especially for serious emulsion turbine oil, it can quickly and efficiently break emulsification, separate water, gas, particles from oil. So that makes sure quality of treated oil to achieve new oil’s standard, ensure whole turbine system work safely. This equipment use a special polymer materials as filter medium combined with vacuum separating technology to break emulsification, dewater, degas, remove acid and particles, make the badly turbid turbine oil becomes clear transparent. Series TY is a perfect turbine oil purifier for live line work; also it can purify low viscosity hydraulic oil and lube oil. 2. Duplex-Stereo film evaporation technology, equips with unique and advanced dewatering, degassing components, can rapidly and effectively separate water, gas from oil. 4. Efficient electric heating system, heating uniformity, less power consumption, safe, and reliable. 5. Double-infrared liquid level sensor, pressure protective system to ensure machine operation easy and safely. 7. Work online with stream turbine, hydraulic turbine. 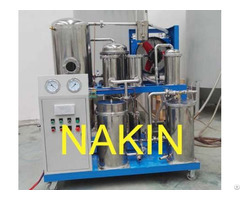 Business Description: NAKIN Company is professional vacuum oil purifier/oil filtration, supply various vacuum oil treatment plants, like the transformer oil regeneration machine, online-turbine oil treatment, old lube oil filtration, engine oil regeneration machine in good quality and competitive price.